Since the Doom of Valyria, it has been shunned by nearly all of humankind. A few people have, however, tried to travel to Valyria, none lived to tell the tale. We have the self-proclaimed Emperor Aurion who went to reclaim Valyria with an army, he was never heard from again even though he had a dragon. Then we have Volantis who sent a fleet to reclaim Valyria too, the fleet was lost with all hands. Then we have King Tommen II Lannister who disappeared along with the Lannister ancestral sword Brightroar in his quest to plunder the ruins of Valyria for knowledge, he met the same fate. Last of all, we have Tywin Lannister's brother Gerion who set out on a quest to find the lost Brightroar, he too went missing. With each campaign meeting the same end, we have the curious case of Euron Greyjoy who claims that not only did he sail to Valyria but also brought back relics such as a dragon-binding horn and Valyrian Steel armour to prove it. He even claims to have found a dragon-egg. So how did he succeed where others before him failed? There's nothing explicit in canon as of now to confirm or reject Euron's claims. We just have Euron's word for it and the relics as proof of his claims. Some of the characters in universe are not convinced of his claims, while most of his supporters appear to be. It is very likely that Euron is lying that he went to Valyria. Let's look back at the previous attempts. Aurion went with a huge army and a dragon and just disappeared. Even his dragon couldn't protect him from whatever curse is hanging over the ruins. Volantis sent an expedition at the zenith of their power and the whole fleet was lost. The same fate befell the Lannister King. One can't even assume that Euron's small party, presumably just Silence and her crew with a few captured vessels, escaped the notice of whatever horrors dwell there because Gerion Lannister's small expedition was never seen again either. Euron, however, has some curious relics with him such as the Dragonhorn and the Valyrian steel armour. No one else in the entire world has such an armour or such a horn as far as we know. But that doesn't mean that he must have found them in Valyria. He could have found them aboard some ship he looted or anywhere in Essos really given that Valyria spanned over most of Western Essos and there are Valyrian relics all over the free cities. While Euron likes to boast about his expedition a lot, he quickly becomes angry and evasive if someone questions it. “When?” The voice was Lord Rodrik’s. “When shall we return, Your Grace? A year? Three years? Five? Your dragons are a world away, and autumn is upon us.” The Reader walked forward, sounding all the hazards. “Galleys guard the Redwyne Straits. The Dornish coast is dry and bleak, four hundred leagues of whirlpools, cliffs, and hidden shoals with hardly a safe landing anywhere. Beyond wait the Stepstones, with their storms and their nests of Lysene and Myrish pirates. If a thousand ships set sail, three hundred may reach the far side of the narrow sea... and then what? Lys will not welcome us, nor will Volantis. Where will you find fresh water, food? The first storm will scatter us across half the earth. “Have you?” the Reader asked, so softly. Euron shrugged. “The price of slaves is rising. We will sell our slaves in Lys and Volantis. That, and the plunder we have taken here, will give us sufficient gold to buy provisions. Note how his reaction and even when urged by his brother publicly, he merely answered the logistical questions and did not talk about his Valyrian adventure. The recently released Fire & Blood provides us more information about someone who almost certainly visited Valyria and came back. What befell that person should more than rubbish any claims Euron might have. Princess Aerea was the daughter of Queen-Dowager Rhaena and for a time heir to her uncle King Jaehaerys I. She quarrelled with her mother, took Balerion the Black Dread (largest and oldest dragon in the world at that time) for her mount and disappeared. Her mother and her uncle searched for her everywhere but could not find any trace of the girl. Eventually the King just gave up the search while Queen Rhaena kept looking for her everywhere in Westeros. After a few years, the Black Dread reappeared over King's Landing and on his back was a skinny starved girl whose clothes were in tatters. When the dragon landed in the Red Keep, the Princess only managed to say "Please, I never" and collapsed. Ser Lucamore Strong, a Knight of the Kingsguard who took the Princess to her uncle testified that the girl was burning with a fever so high that he could feel it in his armour. He also claimed that there was something moving within her (King Jaehaerys later forbid him from mentioning it ever again). The most stunning thing was that the Black Dread himself had wounds and gashes all over him. What horrible thing could do that to the world's largest dragon? Anyhow, The Grand Maester and his staff tried their best to save her but she perished within the day. Septon Barth provides us a lot of details into what happened to her. She was literally burning and Barth claims to touch her skin was as if to put your hand into a pot of boiling oil. Her lips and eyes were bleeding and there were creatures moving within her. Her skin grew darker and darker by the hour and started cracking as if she was burning from inside until it looked like pork cracklings. There was smoke coming out of all her cavities and then her eyes burst. The Septon and Grand Maester put her in an ice cold bath which stopped her heart due to shock of the immersion. And then serpent like creatures came out of her, serpents with hands, faces and mouths. They died immediately on contact with ice. And he believed that while they had all been wondering where had Aerea taken the Black Dread, they should have instead asked themselves where did Balerion take Aerea? The dragon was the only living thing who had seen Valyria alive, when he came with Aenar the Exile came to Dragonstone. When the inexperienced Aerea took the dragon for her ride, she failed to control him and the dragon took her to his home; Valyria. That's the only destination which explains the fact that no one in Westeros or Essos saw the Black Dread although there were reports that a Black Dragon was fighting in pits of Meereen but Septon Barth dismissed them as rumours. “Though I can offer no certain proof, I can suggest an answer. It seems to me that we have all been asking the wrong question. Aerea Targaryen was still well shy of her thirteenth nameday on the morning she slipped from her mother’s castle. Though no stranger to dragons, she had never ridden one before…and for reasons we may never understand, she chose Balerion as her mount, instead of any one of the younger and more tractable dragons she might have claimed.Driven as she was by her conflicts with her mother, mayhaps she simply wanted a beast larger and more fearsome than Queen Rhaena’s Dreamfyre. It might also have been a desire to tame the beast that had slain her father and his own dragon (though Princess Aerea had never known her father, and it is hard to know what feelings she might have had about him and his death). Regardless of her reasons, the choice was made. “The princess might well have intended to fly to King’s Landing, just as her mother suspected. It might have been her thought to seek out her twin sister in Oldtown, or to go seeking after Lady Elissa Farman, who had once promised to take her adventuring. Whatever her plans, they did not matter. It is one thing to leap upon a dragon and quite another to bend him to your will, particularly a beast as old and fierce as the Black Dread. From the very start we have asked, Where did Aerea take Balerion? We should have been asking, Where did Balerion take Aerea? “Only one answer makes sense. Recall, if you will, that Balerion was the largest and oldest of the three dragons that King Aegon and his sisters rode to conquest. Vhagar and Meraxes had hatched on Dragonstone. Balerion alone had come to the island with Aenar the Exile and Daenys the Dreamer, the youngest of the five dragons they brought with them. The older dragons had died during the intervening years, but Balerion lived on, growing ever larger, fiercer, and more willful. If we discount the tales of certain sorcerers and mountebanks (as we should), he is mayhaps the only living creature in the world that knew Valyria before the Doom. “And that is where he took the poor doomed child clinging to his back. If she went willingly I would be most surprised, but she had neither the knowledge nor the force of will to turn him. “What befell her on Valyria I cannot surmise. Judging from the condition in which she returned to us, I do not even care to contemplate it. The Valyrians were more than dragonlords. They practiced blood magic and other dark arts as well, delving deep into the earth for secrets best left buried and twisting the flesh of beasts and men to fashion monstrous and unnatural chimeras. For these sins the gods in their wroth struck them down. Valyria is accursed, all men agree, and even the boldest sailor steers well clear of its smoking bones…but we would be mistaken to believe that nothing lives there now. The things we found inside Aerea Targaryen live there now, I would submit…along with such other horrors as we cannot even begin to imagine. I have written here at length of how theprincess died, but there is something else, something even more frightening, that requires mention: “Balerion had wounds as well. That enormous beast, the Black Dread, the most fearsome dragon ever to soar through the skies of Westeros, returned to King’s Landing with half-healed scars that no man recalled ever having seen before, and a jagged rent down his left side almost nine feet long, a gaping red wound from which his blood still dripped, hot and smoking. If there are creatures so mighty in Valyria who can fight, wound and force to fly even the Black Dread, and horrors beyond our imagination in Valyria, we can safely call Euron a liar. There's no way he could have succeeded with his longboat where Emperor Aurion and the Black Dread failed. 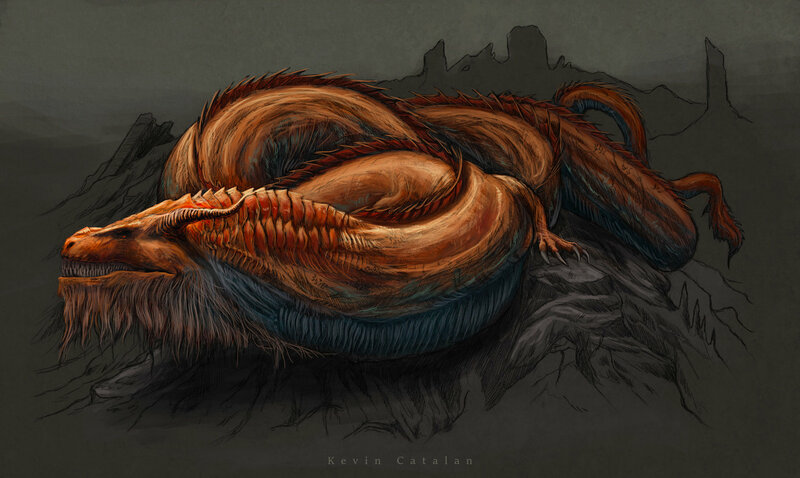 We've also got to remember that Old Valyria was host to a creature called a Firewyrm as well, referenced in A Feast for Crows chapter 22-Arya, regarding Valyria's slave mines, "And there were wyrms in that red darkness too... Firewyrms. Some say they are akin to dragons, for wyrms breathe fire too. Instead of soaring through the sky, they bore through stone and soil. If the old tales can be believed, there were wyrms amongst the Fourteen Flames before the dragons came. The young ones are no larger than that skinny arm of yours(Arya's), but they can grow to monstrous sizes and have no love for men...Burnt and blackened corpses were oft found in shafts where the rocks were cracked or full of holes." And we know from real life that there are parasitic creatures, worm or not, that can burrow into skin, or are laid in it, which can devour a creature from the inside out, for instance Botfly larvae are laid as eggs on the skin of the host and then burrow beneath the skin to pupate, crawling out of the hole they ate into their host to finish the transition to their adult form after dropping to the ground, but if they're ingested in some manner they can attach themselves to the intestinal lining and grow there. So if Princess Aerea Targaryen somehow ingested Firewyrm larvae, perhaps, say, through eating the tainted meat of some other creature, and they grew inside her, the larvae would have been absorbing all the nutrients she might have been able to scrounge for which would have been the source of her starvation, their inherently high temperature would have displayed as fever, which would also account for her seemingly roasting from the inside out as they grew, their eating away at her would have accounted for her bleeding, and then, when she died, serpent like creatures with faces, mouths, and, most importantly, hands, crawled out of her, which, if you look at the artwork done by Kevin Catalan (shown below), describes some of the major points of a Firewyrm, including a face with a beard, mouth, and forearms. And they died on contact with ice and water, which would be the antithesis to their own natural fire, thereby dousing their own flame. So perhaps whatever she was infected with was a host of baby Firewyrms. Alright, so I got asked to edit this to give a bit more information in regards to Euron Greyjoy's alleged trip to Valyria, so here’s my answer to that bit. If Princess Aerea and Balerion traveled to Valeria, Aerea infected by Firewyrms, and Balerion horribly injured, enough for arguably the strongest dragon of lore to flee, who's to say the two incidents couldn’t be connected. If the Firewyrms had moved above ground at the eruption of the Fourteen Flames and the depopulation of the peninsula, plus the as of now continued eruptions some 400+ years later, who’s to say the pair didn’t somehow stumble into a Firewyrm nest, as I doubt our intrepid princess would want to venture into any cave. And if the Firewyrms are nesting above ground, had Euron managed to cross the Smoking Sea and set foot upon Valyrian soil, who's to say he would not have been attacked as well while exploring the land and collecting Valyrian relics. So no, I doubt he set foot upon Valyrian soil. But, if he were to figure out a way to survive the no doubt toxic gasses of the Smoking Sea, I wouldn’t doubt he would find a way to trawl the shallows for relics lost in the Shattering of the Valyrian Peninsula during the Doom. That he found the the Dragonbinding Horn and a suit of Valyrian Steel armor while there would be entirely up to speculation, and there are contradictory reports from semi-canonical sources in Martin's A World of Ice and Fire sidebook, regarding the fact that the horn may have in fact come from a quartet of kidnaped warlocks from Qarth, that put the credibility of the horn's Valyrian discovery to question. And in regards to the Dragon Egg he might have allegedly held at one point or another, Euron himself states in chapter 29 of A Feast for Crows, "I once held a dragon's egg in this hand, brother (referring to Victarion Greyjoy). This Myrish wizard swore he could hatch it if I gave him a year and all the gold that he required. When I grew bored with his excuses, I slew him. As he watched his entrails sliding through his fingers he said 'But it has not been a year." And then he admits to throwing the egg into the sea in a fit of temper. Which could either mean he got the egg off the Myrish wizard, or he dredged it up, though by his own wording, and his general personality, I figure he took it from the wizard after he killed him. So that’s one item most probably obtained outside of Valyrian waters (the horn), one tentative maybe (the egg, because while he could have gotten it from Valyria, he could have just as likely have gotten it off the Myrish wizard), and one unknown (the armor, which we known next to nothing about because it’s only now been introduced in a currently unreleased book). So while he might not have set foot on Valyrian soil, it is a posibilty that he was trawling the waters of the waters of the Smoking Sea. A slim one, but a possibility none the less. And I am sorry about not answering the initial question at first, I tend to get too focused on one thing over another, and lose my train of thought easily, so thank you for bringing me back around to the main topic. Also, if he did sail the Smoking Sea, did the poisonous gasses send him off his rocker? Or was he already of his rocker and it made him worse? Or is he just a sociopath? Psychopath? Hm, food for though. What was Euron “Crow's Eye” Greyjoy doing in Valyria? Is it possible that Daario Naharis and Euron Greyjoy are the same person? Do lands other than Westeros suffer from long Winters and live under the threat of Others? How did Daemon Targaryen control both Caraxes and Vhagar? Why was Balon Greyjoy allowed to keep his titles and head after losing his rebellion? What coat of arms does Euron Greyjoy use? Which Wonders and Wonders Made by Man has Tyrion visited?